Football players and other athletes have worn wristbands for many years to help keep their hands dry and to wipe sweat from their faces. But players no longer keep those bands down at their wrists. 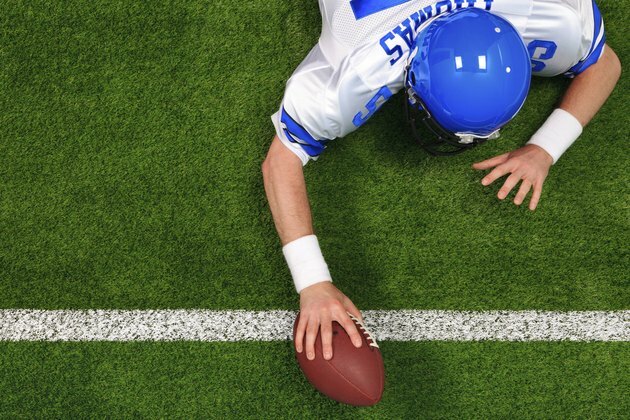 If you watch football, you've seen bands up by the elbow or skinny bands circling the biceps of football players, or even similar bands around the players' knees. In some cases, the bands are homemade, while others are purchased, not for the wrists, but for upper arms. A thin band made of wristband material or similar stretchy fabric serves no real purpose other than to be fashionable. New York Giants linebacker Danny Clark said in a 2008 New York Times article that the bands were there to accentuate his biceps and triceps, adding, "It's a cool look." The article points out that players who wear their wristbands by their wrists are going "old school." If a wrist band, or even a cut-up version of one, isn't a player's choice, a sliced section from an athletic sock or other stretchy material is used. Some players even resort to using athletic tape to get the bicep-enhancing look. NBA basketball players also follow this fashion trend, sometimes having a band on one arm. Some NFL players have picked up on that look and assumed the one-arm band look. Not ones to let a good fashion trend get away, Nike and other manufacturers sell arm bands with the idea that they will help stop sweat. The bands are marketed to athletes who want to show off their arms and rationalize the fashion decision by saying that the bands "wick away" sweat. Players who might normally wear white or black bands around his biceps may opt to wear pink arm bands in recognition of Breast Cancer Awareness Month in October. The NFL has encouraged players to wear pink wristbands, gloves and even pink shoes or shoelaces in recognition of the fight against breast cancer. The bands you see just under players' knees usually serve an actual purpose: They help support the knee joint and stabilize the knee cap. The strap that you see is often used to treat patellar tendonitis, sometimes called "jumper's knee." Basketball players wear them, too. While wearing the strap can relieve symptoms for a short period, the straps or bands do not cure any problems or treat any conditions. So at the end of the day, you are still dealing with whatever underlying problem you had that is causing you knee pain. What Is Causing My Shirt's Elbows to Tear?